In March, the students of Mill Creek and Ludington Magnet School came together for the Ludington Exchange. Students from Ludington visited Mill Creek, then Dexter students visited Ludington. 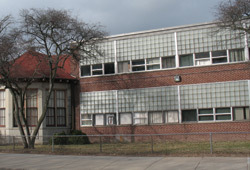 The Ludington Exchange was meant to bring together different learning styles so students at both schools could learn what it was like. Both 7th and 8th graders from Mill Creek were selected to be involved with the exchange. Isabel K, 7th, says, “Teachers selected the students they thought would be best to represent the school.” Some students in the Fry team said that they had to write an essay about why they would be a good person to go. 6th, 7th and 8th graders from Ludington were chosen to visit our school. Luke says, “It was a lot smaller [than Mill Creek]. The lockers were all beat up. There were pipes sticking out of the walls. The teachers were very strict and there were security guards and cameras.” The school may have been very different, but both schools have a excellent academic achievement. It seems both of the schools benefited from the Ludington Exchange.